These days, when retailers manage to top quarterly estimates, even slightly, their stocks spike as if they just announced they were being acquired by Amazon.com Inc. (AMZN - Get Report) . On Tuesday, Aug. 8, shares of Ralph Lauren Corp. (RL - Get Report) soared more than 11% after the lofty fashion designer, distributor and retailer posted first-quarter earnings of $1.11 a share, trouncing the earnings of 95 cents a share Wall Street expected. Its revenue of $13.5 billion came in slightly higher than estimates for $1.34 billion. Michael Kors Holdings Ltd. (KORS reported, also on Tuesday, a blowout first quarter, with earnings of 80 cents a share and revenue of $952.4 million beating Wall Street's forecasts for earnings of 62 cents a share and revenue of $918.7 million. Its stock ripped nearly 22% higher this afternoon. "I think the share price reaction was a little overdone," Tuna Amobi, senior equity analyst at CFRA Research, told TheStreet on Tuesday. Both fashion companies are undergoing turnaround efforts and Amobi said it is "still too early" to judge whether those efforts will have a long-lasting, positive impact on the businesses. Despite the beat, at Ralph Lauren, revenue still plummeted 13% in the quarter compared to a year ago and its North American revenue was down 17%. For Michael Kors, revenue fell 3.6% and its same-store sales were down 5.9%, narrower than the 9.2% slip analysts expected, but still a steep decline. "This is not a signal of strong performance or a turn in businesses exposed to U.S. department stores," John Zolidis, president and founder of financial research firm Quo Vadis Capital, Inc., told TheStreet on Tuesday. Zolidis warned investors that both companies experienced "fairly serious sales declines" and forecast revenue pressures to persist. For their turnaround efforts, Ralph Lauren and Michael Kors are attempting to regain their once-exclusive, luxury brand images, since lost to heightened promotional activity among their department-store partners. 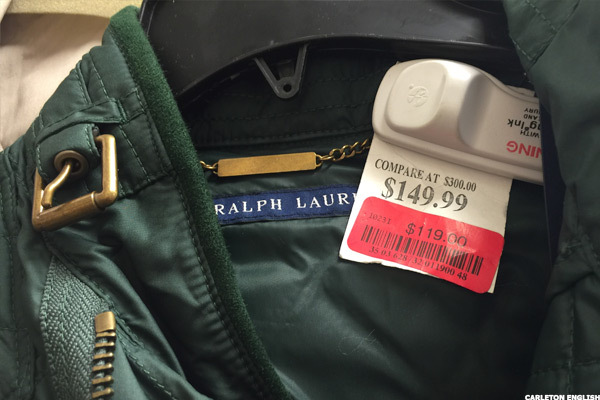 A discount Ralph Lauren jacket at T.J. Maxx. Ralph Lauren said it began reducing shipments to off-price retailers in the first quarter and is "on track" to close 20% to 25% of its department stores in the U.S. by the second half of 2018. Michael Kors unveiled its $1.2 billion acquisition of luxury footwear brand Jimmy Choo plc (JYMHF in July, as it also works to better position itself as a luxury retailer not tied to discount department store companies like Macy's Inc. (M - Get Report) and Nordstrom Inc. (JWN - Get Report) . "I'm curious, very curious," Corali Lopez Castro, partner at Kozyak Tropin & Throckmorton's bankruptcy and commercial litigation practice group, said in an interview on Tuesday with TheStreet. Castro said the better-than-expected financial results from Michael Kors and Ralph Lauren could signal smooth sailing ahead, but she warned that both companies must execute their turnaround plans effectively—by finding their niche again. "Remember when Krispy Kreme first came out and you had to go to their stores to get them?" Castro said. "As soon as they expanded and customers could start getting them at the grocery store, they became not special anymore." Last May, facing declining sales, doughnut maker Krispy Kreme sold itself for $1.35 billion to German food conglomerate JAB Holding, the same company that agreed to take Panera Bread Co. private in April in a deal worth $7.5 billion. Castro applies that of why Krispy Kreme lost its appeal to both Michael Kors and Ralph Lauren—to survive, they must get their products out of outlets and department stores, narrow their availability. She does not expect retailers that fall somewhere in the middle on price, including Macy's, to have a place in the evolving retail environment. She added: "Put your seat belts on and get ready for a wild ride."